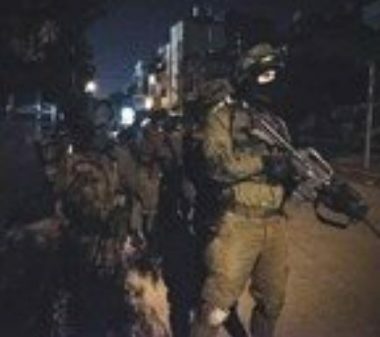 Israeli soldiers invaded, on Wednesday at dawn, several Palestinian communities in the West Bank governorates of Tulkarem, Ramallah and Bethlehem, broke into and searched many homes, and abducted eight Palestinians. The Tulkarem office of the Palestinian Prisoners’ Society (PPS), in northern West Bank, said the soldiers invaded and searched homes in Rameem village, east of Tulkarem, and abducted Hazem Nidal Salman, 22. It added that the soldiers also abducted Nihad No’man Mdallal, 24, from his home in Kafr Sur village, south of Tulkarem. In addition, the soldiers invaded Beit Rima town, northwest of Ramallah, abducted a local folk singer, identified as Mohammad Mahmoud Barghouthi, and Naji Ali Rimawi, after searching their homes. It is worth mentioning that the soldiers attacked Barghouthi’s mother, causing cuts and bruises, before local medics moved her to a hospital. Clashes took place between the invading soldiers and many local youngsters, who hurled stones at the military vehicles. Furthermore, the soldiers invaded Beit Fajjar town, south of Bethlehem, searched homes and abducted Hmeid Mahmoud Taqatqa, 50, and his brother Hatem, 40, in addition to Yousef Ahmad Taqatqa, 26. The soldiers also invaded Husan town, west of Bethlehem, and abducted Ghassan Mohammad Hamamra, 22, from his home.